Several years ago I worked with an eight-year-old girl named Stella in her home. Gina, her mother, was at her wit’s end. She had Stella, a four-year-old daughter, and an 18-month-old son to care for plus household duties, balancing work and home life, and maintaining her marriage. She constantly felt stressed, which was compounded by the fact that Stella was not yet speaking or communicating any needs beyond what she wanted to eat, was still not toilet trained, and made a mess everywhere she went. Gina felt that she spent her days following Stella around the house, picking up after her, and yelling at her to stop. She frequently would find Stella dumping out a bin of toys or sweeping all the books off of a shelf, then try to distract her with a Youtube video or a snack. At this point, Gina was feeling hopeless. So you can imagine that she was highly skeptical when I suggested that using the MotivAider, a simple device that vibrates at timed intervals, might make her life easier. And while she was prepared for me to try to change Stella’s behaviors, she was not expecting me to suggest she change some of her own behaviors. However, she decided to give it a try. To Gina’s surprise, Stella quickly stopped dumping out bins of toys and making a mess all over the house. All Gina needed was an easy reminder to catch Stella doing something good. 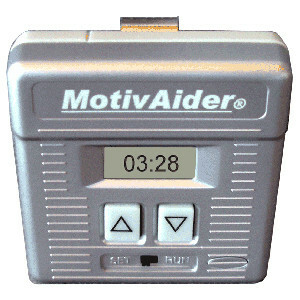 The MotivAider is one of my all-time favorite tools. You can program it to vibrate on a fixed or variable schedule at different duration and intensity levels. I use it for many things, but I’ve had great success in using it with parents. It’s easy for them to use independently, they can use it even when I am not present, and it fits into their busy lifestyles. While I was brought in to help change Stella’s behavior, we also changed Gina’s behavior. When we started, Gina provided reinforcement to Stella at every two minute interval in which she found her behaving appropriately. Over time we increased that interval, so that Stella wasn’t receiving such a high rate of reinforcement. Gina reported that the house felt more calm now, and she had more energy during the day. It also gave her a confidence boost. Having success in this one area made her feel more hopeful and invested in creating success in other areas. Other families I’ve used it with have experienced similar results. One simple tool can lead to massive change for a family. **Names and identifying characteristics have been changed to protect the identities of my clients. Written by: Different Roads to Learning on November 7, 2013.on June 19, 2014. This entry was posted in ABA, Behavior, Reinforcement, Sam's Tips and tagged ABA, Applied Behavior Analysis, motivation, prompts, reinforcement, Sam Blanco BCBA by Different Roads to Learning. Bookmark the permalink.